1)How to get button.tag via longPressGestureRecognizer? In my application I have 12 UIButtons in my xib. On the long press of UIButton I have this method getting called. Using gesture.view.tag property always gives me same tag(i.e) every time when I click on different UIButtons. Before someone gets confused with xib, I must say that UIButtons are set to Custom type so they are invisible under UIImageView. It appears that a UIGestureRecognizer can be tracking more than one view, but it does not report that it is tracking more than one view. Thus, when you check the view property of a UIGestureRecognizer, it is set to the last view that the recognizer was added to. A gesture recognizer operates on touches hit-tested to a specific view and all of that view’s subviews. It thus must be associated with that view. 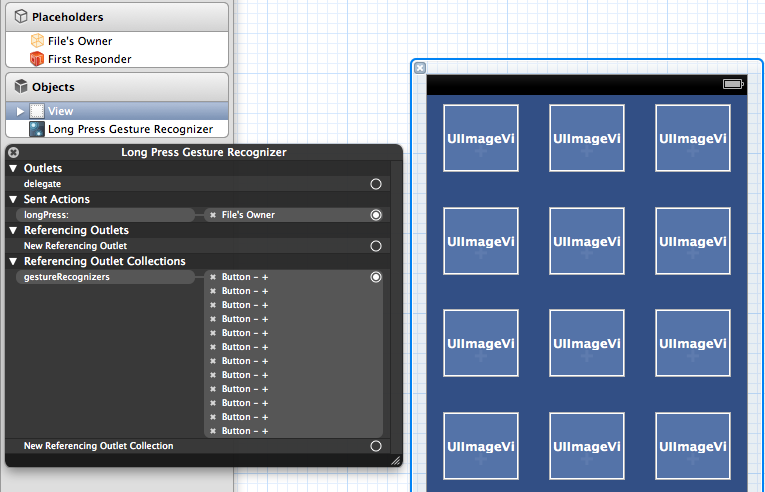 To make that association you must call the UIView method addGestureRecognizer:. A gesture recognizer does not participate in the view’s responder chain. The solution in this scenario is to have a gesture recognizer for each view that needs recognizing, and have them linked to the same delegate selector. Note: this question (and my answer) originated in the NSChat chat room, on March 20th, 2013. It was decided to post here for future reference. Not the answer you're looking for? Browse other questions tagged iphone ios objective-c uibutton uigesturerecognizer or ask your own question. Can you attach a UIGestureRecognizer to multiple views? How to get button.tag via longPressGestureRecognizer? How do you create a gesture recognizer for a custom cells button in a tableViewController that will be able to identify the cell it is in?